Among the many changes wrought by World War II was the birth of the American war movie. Newsreels produced by the likes of John Ford were accompanied by dramatizations of the exploits of America's brave fighting men, such as Howard Hawks' Sergeant York and Flying Tigers, starring John Wayne. These films served as wartime propaganda for the Allied side, produced by an artistic community trying to do its part. The good guys and the bad guys had to be easily identifiable, a skill Hollywood picked up from making westerns and Saturday morning serials. After the war, moral ambiguity crept back into film. 1946 saw both William Wyler's The Best Years of Our Lives and Frank Capra's It's a Wonderful Life, stories about people on the front lines and on the home front wondering if it was all worth it. In England, Stairway to Heaven saw David Niven arguing before a court of angels that the actions he took in war were just. But then a funny thing happened: American audiences decided they liked the moral certainty of wartime propaganda, and Hollywood, which always does what puts butts in seats, gave them more of it with films such as Sands of Iwo Jima. In 1955, real-life American war hero Audie Murphy, awarded a Congressional Medal of Honor at age 19, played himself in To Hell and Back, the dramatization of his wartime memoir. The war that created the need for propaganda was over, but military propaganda had become a genre in its own right. Perhaps that history can shed some light on the success of American Sniper, which has soared past $200 million in box office in two weeks. Unlike World War II, the War on Terror provided no moments of catharsis. 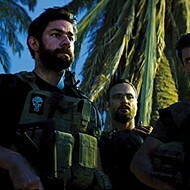 Bin Laden was shot offscreen, necessitating the creation of the last great military propaganda movie, Zero Dark Thirty. But with its female protagonist and recognition of the moral complexity of asymmetrical warfare, it was no Flying Leathernecks. Fortunately, Clint Eastwood knows how make a real, old-fashioned war film. 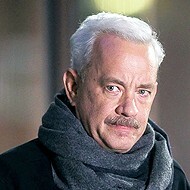 He was in Where Eagles Dare with Richard Burton. He was also in Kelly's Heroes, but American Sniper is not about to paint its real-life hero Chris Kyle (Bradley Cooper) and his band of SEAL sidekicks as cynical rogues in uniforms out for plunder. Nor is Eastwood here to contemplate the wisdom of Bush's great blunder into Iraq. The single worst decision in American foreign policy history is announced with a celebratory cellphone call that interrupts Cooper's wedding to Taya (Sienna Miller). Iraq's connection to the 9/11 terrorists is implied but never stated; the words "weapons of mass destruction" are never uttered. Eastwood's not here to rehash the debate over the Iraq War, he's here to make the people who were duped into it feel better about that $2 trillion they just buried in a hole in the desert. He aims to make Cooper into John Wayne for the generation that spent the best years of their lives in Fallujah. His directorial mode seems to be, "Do it like we did it in the old days." And he's right! The old ways were better, at least when it comes to film craftsmanship. Eastwood's battle sequences have a clarity and tightness hacks like Michael Bay can't begin to touch. There's nothing the least bit expressive or off-putting in Eastwood's lighting or framing. He understands classical film grammar and knows how to deploy it to maximum emotional effect. American Sniper is about, and for, the men — and it's all men — who did their duty bravely in Iraq. That they were sent on a fool's errand doesn't matter to them, to Eastwood, or to the audience. American Sniper is not shy about dividing the good guys from the bad guys: Kyle calls the Iraqis "savages." 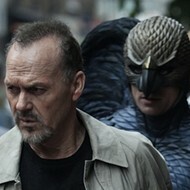 But Eastwood understands that heroes should behave heroically. Unlike the recent Fury, he doesn't portray American soldiers as rapists who shoot POWs in cold blood. Kyle only kills "military-aged males" — and women and children who really deserve it. 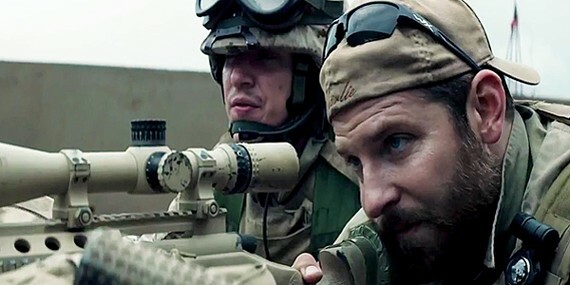 Much has been made of American Sniper's alleged historical inaccuracies, but it doesn't matter. I'm no expert on military protocol, but I'm pretty sure Kyle's habit of calling his wife while in the heat of battle is frowned upon. But those tearful calls lend a good, emotional punch to a scene. To paraphrase another great American war movie, Apocalypse Now, charging a man for lying in a movie about a war based on a lie is like handing out speeding tickets at the Indy 500. American Sniper is not showing in any theaters in the area.